Sad, because – unlike the many other ephemeral pop sensations of the eighties – The Buggles were special in their own small way. Whilst many will remember the hit single, few realise it was the work of Trevor Horn – one of the greatest British music producers of that decade. In a sense, The Age of Plastic was a dry run for what he subsequently went on to do with ABC, Propaganda, Frankie Goes to Hollywood, Grace Jones, Art of Noise and Seal. Not only did The Age of Plastic showcase the audacious songwriting and production talents of this young session musician – a man whose previous career high was playing bass on a couple of minor late seventies hits for his then girlfriend Tina Charles – it was a snapshot of the nascent electronic music scene at an important time. Indeed, The Buggles did much to break what soon after came to be called New Romantic, bringing a heady mix of synthesisers and futurism to the pop charts. 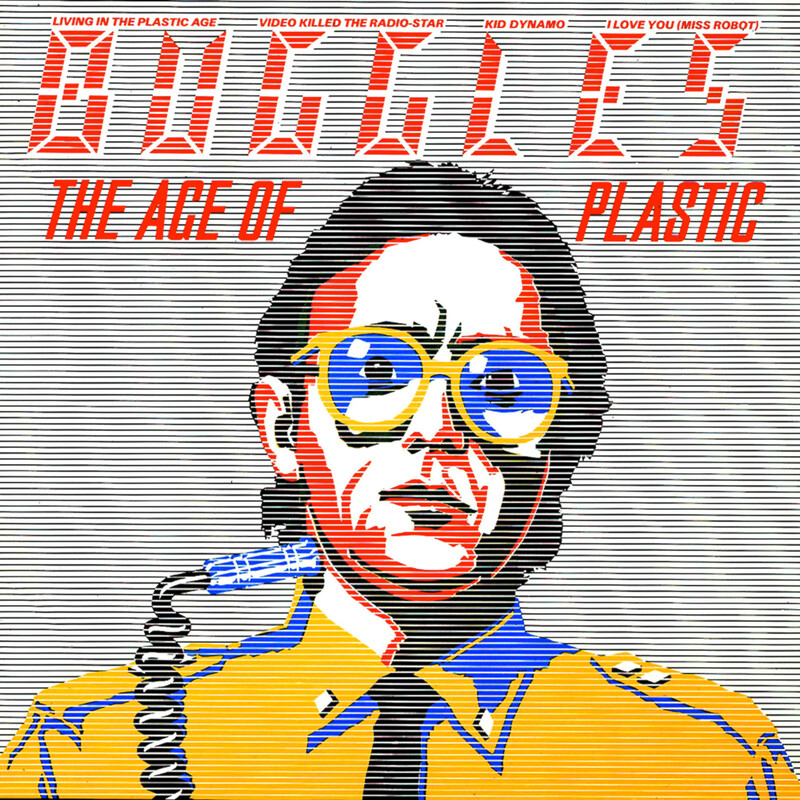 The Age of Plastic was packed full of sumptuous vintage synthesiser sounds – from ARP Solinas to Mini Moogs and Sequential Circuits Prophet 5s – beautifully layered by Horn and fellow Buggle Geoff Downes. Costing Island Records a cool £60,000, it was an expensive production by the standards of the day, and indeed of other electronic bands such as The Human League. Indeed, listen beyond those catchy lyrics and you’ll hear a complex and highly polished sound, recorded at Virgin’s Town House studio with some of the best technology of the time. Musically more complex than its infectious melodies would suggest, just recording the first single Video Killed the Radio Star took an entire three months! Yet what stands out most about The Age of Plastic is its concept. Ironically, it was recorded right at the high watermark of New Wave in 1979, a movement which militated against such early-seventies musical self-indulgence. But this was very much a concept album, and it completely caught the zeitgeist. At a time of digital watches, home computers, synthesisers, space shuttles and satellites, there was a sense that the future was finally here. Popular culture had been alluding to this for years, from Nicholas Roeg’s The Man Who Fell to Earth to Kraftwerk’s The Man Machine, Britain was being wowed by technology – and here was an album that soundtracked it. The Age of Plastic was a popular seller, but garnered little critical acclaim. Berated variously for being faddish, trivial, ephemeral and “awful beyond measure” (The Guardian), it was largely forgotten – only now is it being referenced by a new generation of electro musicians like Justice and Daft Punk. However, one journalist who loved it was New Musical Express’s Paul Morley, who interviewed Trevor Horn about it and then later when on to form ZTT Records with him – the label was to have enormous commercial success with Frankie Goes to Hollywood. The Age of Plastic is a brilliant record in its own special way. Its concept and lyrics are far more satisfying than expected, while the music is richly layered and full of saccharine melodies. It works superbly as an album played all the way through and pulls you into a curious but compelling vision of a future world. It was Cyberpunk’s first manifesto, and The Buggles were its founding fathers. I love this album and always have. It reminds me of the worlds created in, particularly, Max Headroom but also The Bicentennial Man, I Robot, Blade Runner, The Matrix etc. Plus it spawned the also very good, if a bit more mainstream Adventures in Modern Recording. This of course led to the ‘popifying’ of Yes with the excellent Drama and 90125, and subsequent not quite so good ones.